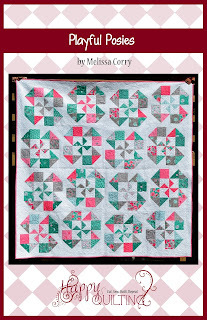 Happy Quilting: A Very Sweet Celebration!! And it gets Sweeter with a Giveaway!! A Very Sweet Celebration!! And it gets Sweeter with a Giveaway!! I can't tell you how excited I am to be a part of this amazing group of "Chefs". This book has been such a journey!! It has been a long time in the making but I am sure you will find, it was well worth the wait!! 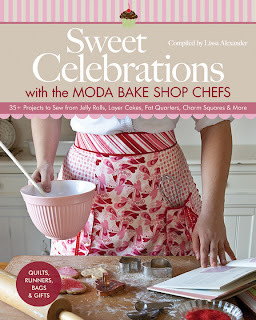 Each of the projects in the book are for an annual celebration and each of us "chefs" were assigned one of those Celebrations for the blog hop!! So for the Blog Hop, Moda decided to do a little "Getting To Know You". Oda May prepared us a list of questions. The questions were totally random, which I loved as I tend to be random all the time. 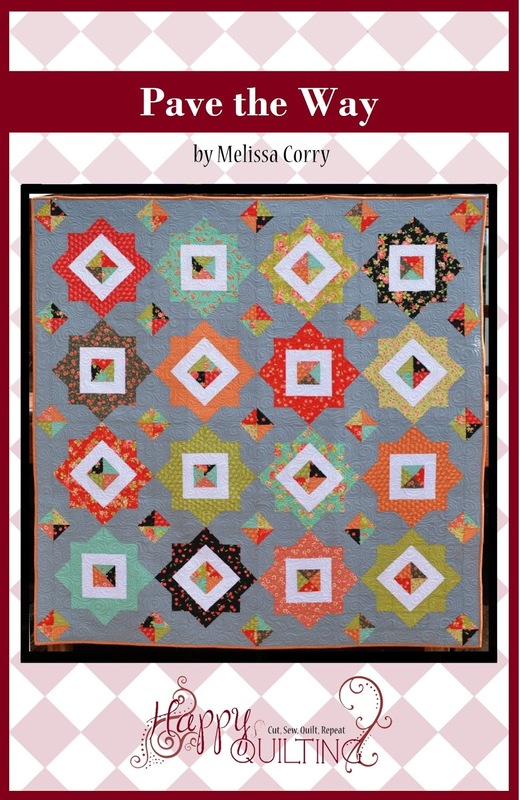 So without further ado, a little more about the Happy Quilter. Enjoy!! Do your pets/kids/spouse help or hinder your creative process? My husband supports me in this creative (and sometimes crazy) process fully with only the occasional grumbling when his shirts end up at the bottom of the ironing pile under a mountain of blocks. If you could patchwork bomb a spot in your town, where would you choose and why? If you could have a quilt shop spree, which items would you snag off the shelf?? Pre-cuts, Pre-cuts, Pre-cuts!!! I love my Pre-cuts. 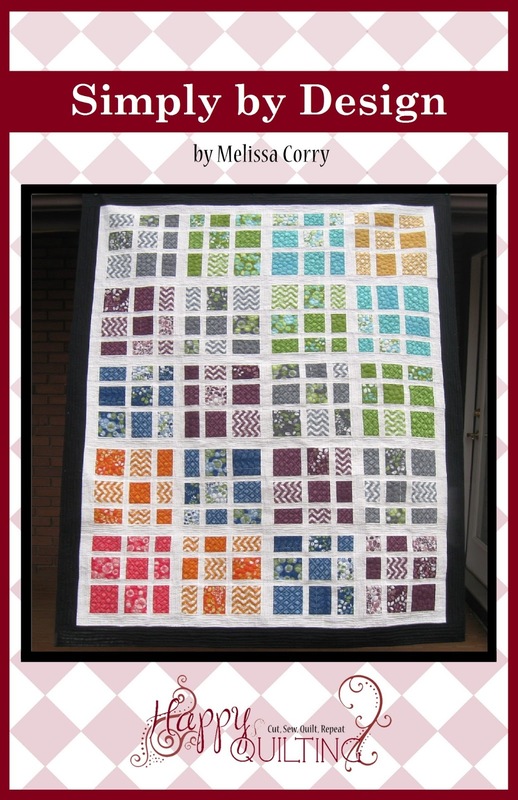 I love the amazing selection of prints, the perfectly coordinating colors, and the huge amount of time I save cutting!! Easy Peazy, Lemon Squeezy!! I started looking through old photos trying to remember a favorite birthday memory. I quickly realized, I don't have a lot of recent birthday memories of me, but I do have a ton of Birthday memories of my children. I especially love the first birthday!!! These little ones change so much in 1 year and on each of their first birthdays I take a minute to reflect on how they have grown, and what a special place they have in my heart. 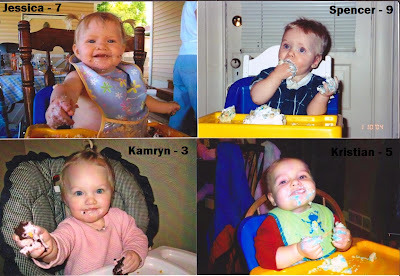 Jocelyn just turned 1 a few weeks ago and she, like her siblings, loved it to the last bite! Do you prefer to celebrate with cupcakes, cake pops, or just plain old cake? None of the above!!! So this might be weird, but I really don't like frosting. Doesn't matter what kind, I just don't like it. So here I am at my last birthday (surprised we took a photo) and in front of me you will see a nasty frosted cake. This is a prop cake. Its sole purpose is for the kids to be happy. We sang, I blew out the candles, the kids had huge globs of icing with ice cream - tradition complete! And then I pulled my customary individual birthday cheesecake from the fridge ;) Nothing say's Happy Birthday to Me like a Cheesecake!!! And as part of this blog hop, each of the chefs are sharing their favorite recipe from their assigned Celebration. So of course, I am sharing my favorite Snickers Cheesecake recipe! It's so yummy and so incredibly easy to make!! 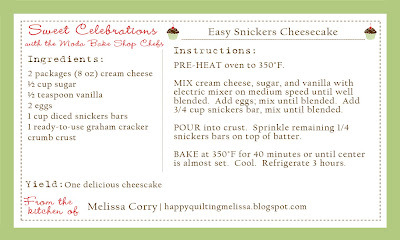 You can go here to print this recipe in either a 3 x 5 recipe card or a 4 x 6 card card or just click on the Printer Friendly Version below :) Collect all of the recipes along the hop to keep with your book!!! So that's a little about me. Random for sure, but there you have it, little ol' me :) So now, let's get to the part about little ol' you!!!! The Giveaway!!! And for a complete list of all the hop stops just click on the banner!!! Enjoy the Sweet Celebration!!! Oh dear. Am I first? On my 50th birthday we moved into my dream house. DH was totally off the hook for a present that year. Thanks for the chance to win this great book. so happy for you to be a part of this great, fun book! All my birthdays are special, being a 6 year breast cancer survivor..Just being with loved ones is my idea of a perfect day..this one will be my 70th! A pretty silver watch when I was 12 would have to be my favorite gift..thanks for the giveaway..
Great giveaway!!! 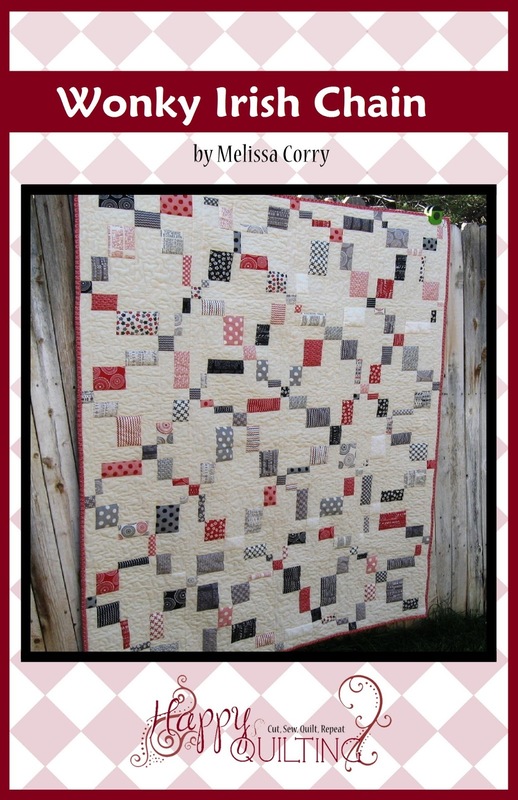 I love it:) My ideal birthday gift would be a new sewing machine:) Thanks for the chance to win! My mom, how in the world she found it I do not know but she did...found the set of books my 4th grade teacher used to read to our class after lunch each day. My 4th grade teacher has long passed away, and 4th grade, was forever and a day ago...so you can imagine my delight in seeing these books. I recognized them from the book spine before I even got them completly unwrapped. As I reread the books over the summer...I could hear Mrs. Dugan's voice once again as I read. A treasure! My birthday is in December and those tend to run together with Christmas. My favorite of my children is the year we bought the older two a swing set. We got it the night before the oldest turned four. His dad worked second shift and he was home with him in the mornings. He came and woke his dad up and said, "Dad, what is that big box in your truck?" They spent the day working on putting that deluxe swing set together. When I came home he met me with a toolbox and said, "Dad said if I am good and help with Ben you can finish putting our swingset together. I brought you the tools." I still remember what utter faith he had I could do it and I did. He told everyone, "This is my new swing set Dad and Mommy built for me with my tools." Too long a story but thanks for letting me share it. I miss those little boys. Thanks for the recipe, post, and giveaway! My all-time favorite present was my kitchen-aid stand mixer! I love "baking" with food and fabric, so it was great! Perhaps it will assist me in some of these delicious recipes!!! Oh Snickers - yum!! I shall be trying that recipe!! My favourite birthday present was a picture frame that my mother gave me and it was a cast silver (not real silver but a metal of some sort) of buttons - so the frame was all buttons. She passed away a month later so I know that when she picked it out it was a special one as she knew my love of buttons and it was all she could manage as she was so ill at the time. It is a very special birthday present. My fav birthday pressy was a day trip out to Dingle Bay where we went on a boat to see Fungi, it was just the best day. Hmm....I don't know about a favorite birthday present. Maybe getting a new bike when I was a kid? I do remember a favorite anniversary present though, my Bernina sewing machine which was last year. Best. Present. Ever. I think it has my memory clouded! It will take quite a bit to top that too. My favorite birthday present is an amethyst ring my hubby gave me for one of my birthdays to go with the necklace he gave me for Christmas. My favorite birthday present was a Barbie Doll - many, many years ago. I sewed a lot of dresses for her. Thanks for the recipe & the chance to win. 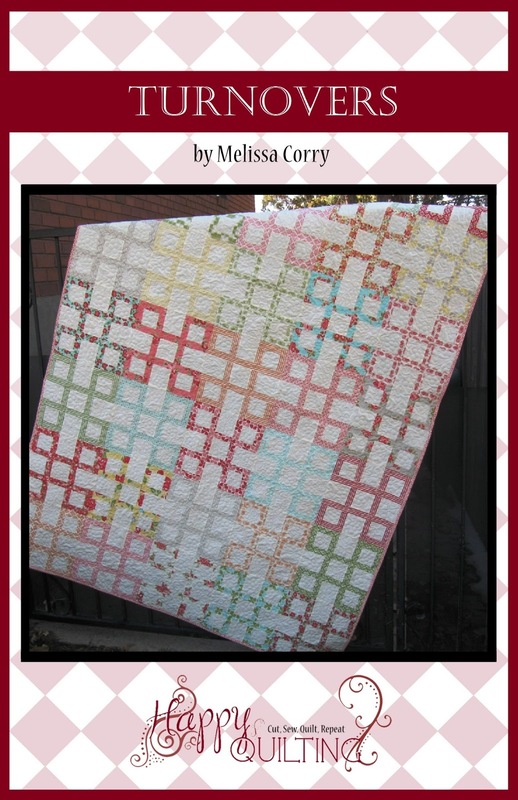 Many years ago, before I had been to any big quilt shows, my husband gave me a trip to the AQS show when it used to be in Nashville. Amazing! As a kid, I remember my Dad putting my Barbie Dream House together.... he was an engineer and thought it was just about impossible to construct this house! We laughed through the whole process. Thanks for the great giveaway! A pony! Really! We lived on a farm, but I was afraid of large animals. My dad was so happy when I finally asked for a horse that he actually got me one. My husband is brilliant, because lately inside each card are a few nice green bills with a band around them inscribed "Fabric Money". Easy, stress-free, perfect, needed, wanted, winner!!!! My favorite birthday present was a bride doll with a complete (hand sewn) wardrobe when I was about 8 or 9 years old. The surprise birthday party my hubby threw for my 30th birthday was pretty memorable. I had NO CLUE what he was up to and he was so excited to have pulled it off. What a fun looking book Melissa. Hmm, favorite bday present...a surprise visit to the LQS with some cash to go shopping :) Thanks for a fun hop/recipe! I loved it when my son was pretty small my husband would take him to the lqs and have him pick out a handful of fqs...so fun for me to receive! Congrats on the book, it looks wonderful! Congrats! My favorite gift is the handmade cards from my kids! my favorite birthday gift was when i was about 5 it was a ladybug coin purse. My most recent favourite birthday present was a surprise lunch with family and friends, followed by a surprise date night away while my sister babysat the kids! Usually DH and I (who have birthdays 5 days apart) will celebrate by just going out to dinner. But, one year he surprised me by getting me a 100 dollar gift card to the local Hobby Lobby.. Can you say that baby was spent on fabric right quick!! Hmm....my favorite birthday present was a sister born on my 8th birthday. She and I have a special bond because of it. My favorite birthday present has always been the coupon books my kids make for me ("good for 1 day of not arguing", "good for 1 room cleaning", etc.) It's fun to see what they think is valuable to me! Can't wait to see this great book - thanks for the chance! We don't do a lot of gifts. But I did get a Kindle two years ago for my birthday... that would be the one my Honeyman sat on and broke this year Aa week before my birthday. So this year my sweet baby brother bought me a Kindle Fire for my birthday! I cried! Everything I should get for my birthday is my favorite - taste changes a lot. Thanks for sharing and the giveaway. I love books as presents:) best gift for all the time! I love to spend time with my family so this year they treated me to a trip to our local lighthouse and a picnic. I really loved it!!! 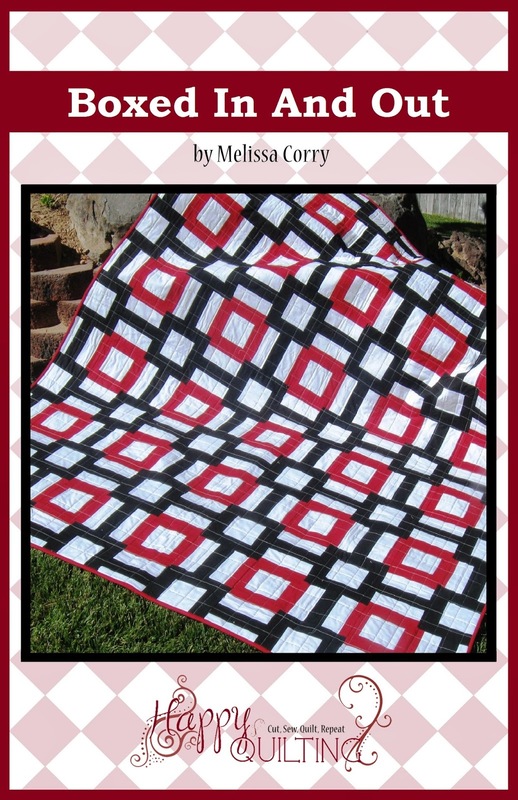 A recent favorite was a large girt certificate to a local quilt store. It was extra special because it was from my son and his wife. My favorite birthday is any gift when someone remembers my birthday. I tell everyone not to give me gifts....my house is overflowing with "stuff"...all I ask for is time...lunch or dinner at a favorite restaurant with people I love. Thanks for the opportunity to win this great book...I love your blog...I am one of your followers. Blog hops are so wonderful! Love to read about all designers and get to know them a bit. And explore blogs I never read before! About birthday presents: I like the home made ones most! Food, in fabric... it doesn't matter. Only the feeling someone made something special for me is so heart warming! For my 30th birthday a few years ago we took a family trip to Disney World. Such a great gift! Congrats and I would love to have a copy of that book for my very own. My birthday was over the weekend and it would be a great gift for me. 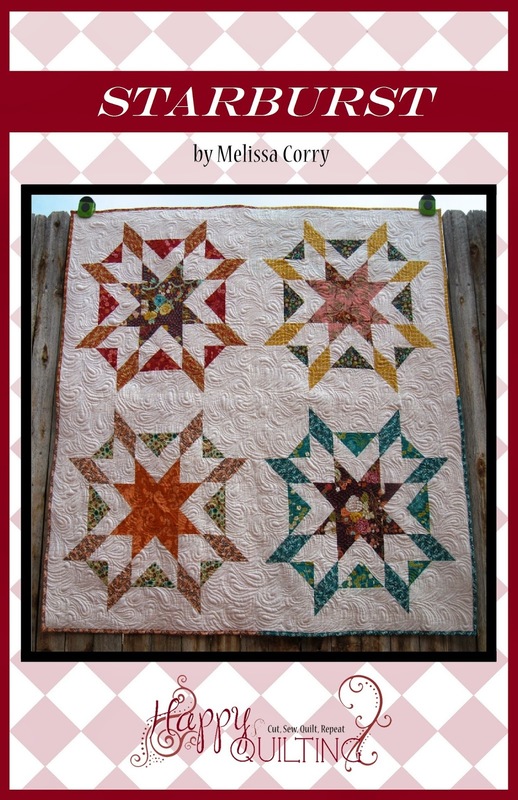 My favorite present....3 years ago for my gift my mom paid for my beginning quilting class. 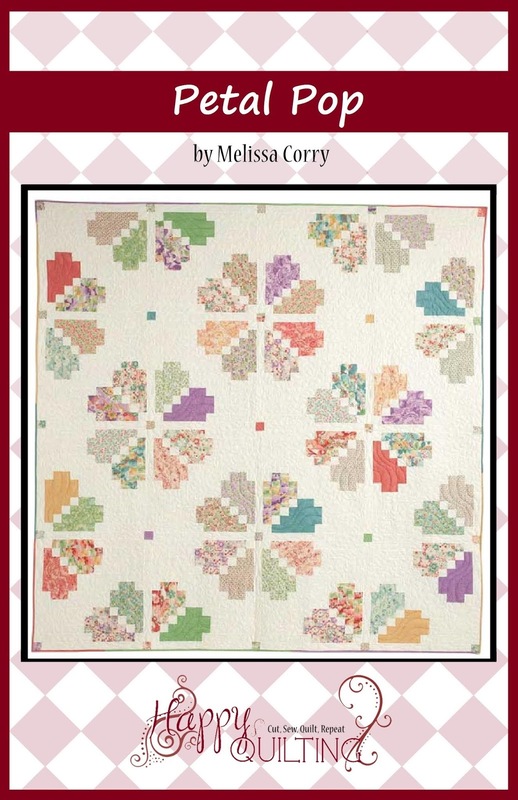 The start of my love of quilting began with that class. I'l never forget it. This book sounds like fun for every holiday celebration...yes birthdays are holidays! One of my favorite gifts is a simple scissor charm that I wear on a necklace. Thanks for the giveaway! My favorite birthday "gift" was this past summer. I was able to spend a whole week with both of my daughters (young 20's, living in 2 other states)at the beach. 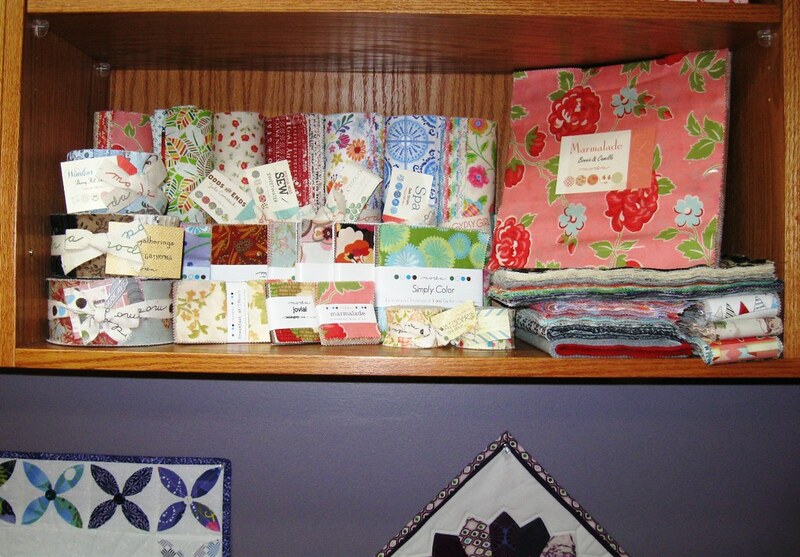 My favorite birthday gift is probably a gift card to buy more quilt fabric! A watch. Thanks for the recipe and giveaway! I think some of my favorite birthday gifts are the things made by my grandchildren. I cherish their drawings and paintings. Thanks for the recipe (it sounds delicious) and the chance to win! The book looks great. 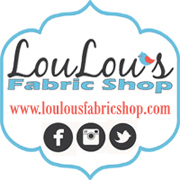 My favorite birthday present are gift cards to fabric shops! My favorite birthday gift is time away in the high desert of Oregon... we go every year and it's the best thing I could ever hope for! First thing I would like to comment on, kids come first, first, first and your children are all soooo cute,love the birthday photos. I have to agree that the birthday highchair photos are the best, get the pic then off to the tub the baby goes.Love your 2 sneak peeks can't wait to see the book and I just love layer cakes of the fabric kind. The best birthday present i got were 2 cards for one birthday, one from each son, when they were away at college. They were so funny and it made me cry that they thought ahead enough to send a card when they were in the middle of finals. if you have had boys that age you know how special ( unusual)this is. 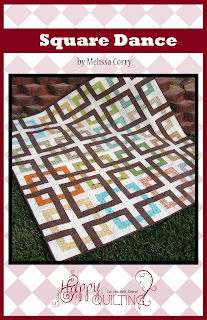 Second fav is the longarm from my husband. my birthday is on halloween, so i have received many pumpkins over the years (love those) and witches (don't love those so much)!! thank you for the giveaway!! I love gift cards to quilt shops for my birthday! Thanks so much for the recipe and the giveaway!!! gift cards to shop! and random vintage crafting stuff added on to presents are always fun... but I think I'm the only person that does that - I've never got any. My favorite birthday present is a silver bracelet that my Mom had made for me when I turned 40. She had one for a long time and I'd always admired it, but knew they were just too expensive for me to ever have one. Then suprise I had one too! My favorite birthday gifts come from a quilting buddy who makes me feel special on my day. 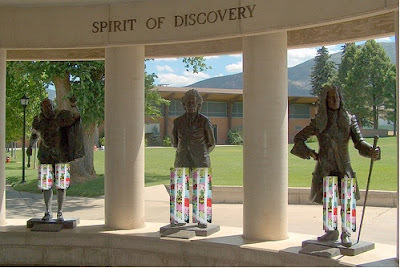 She is also very innovative in gifting and it always includes something quilty. My favorite birthday gift was a charm bracelet from my mom...it had a special SWEET 16 charm! I'm going to try that cheesecake tonight! Adorable kids! DH got me a beautiful silver Black Hills Gold ring a few year ago for my b-day. Unfortunately, I lost somewhere in southern California this spring - so he bought me another one for my b-day! My favorite birthday gift was on my 40th, my husband surprised me with my "first ever" birthday party. Surprising me is not an easy thing to do and he did an amazing job and we all had a lovely time. Thank you hunny, and thank you for the opportunity to win this "sweet" book! My Daughter In Law gave me a scrapbook that is very special to me. It may sound strange, but I don't really remember my birthday presents especially well... what I do remember is my best birthday day. It was my first birthday with my now husband and his son -- we went to Farmer's Market in the morning, had a picnic lunch/nap in the park, went out for ice cream, played a game of monopoly at home before leaving my step-son with the babysitter while we went out to dinner and then to my favorite bar to play pool. It was just an easy, lovely day and I really cherish the memory. 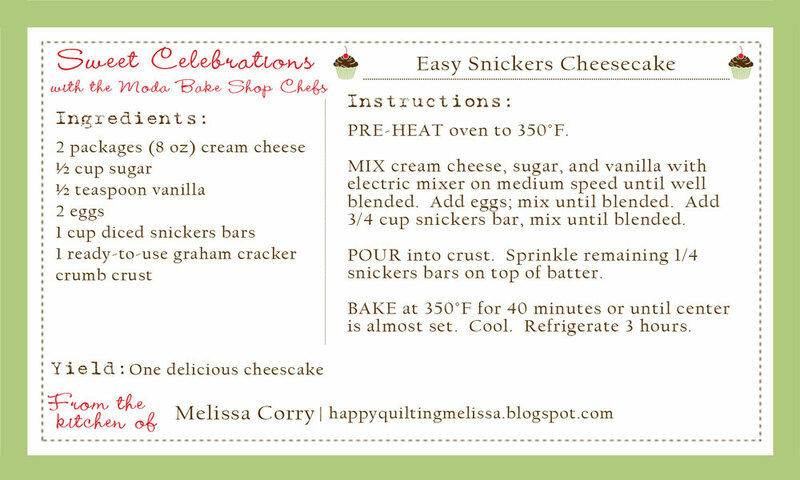 The Snickers Cheesecake sounds delicious! A combination of Snickers AND cheesecake?!? Oh my goodness-- how could it be anything less than fabulous!?! Maybe I'll try one for my sister's birthday at the end of the month! Thanks for the recipe! Just had my birthday and my family surprised me with a standquilthoop! I was over the moon! Thanks for the sweet treat. Have to try this! My favorite birthday gift was given this past year by my sweet husband. He surprised me and took the whole family on a cruise! It was so much fun and we had precious time with our young adult children which becomes more rare all the time. Would love to be entered in the giveaway! included the stones of my two boys, and their brother who is in heaven, it means so much to me to have it. Thanks for the chance to win. We seldom celebrate my birthday, but once it was a gift from my boyfriend that he asked me to marry him. :) I said: YEEEEEEEEES! When I was seven, I got my first two-wheeler. It was a used boy's bike, but I didn't care. I couldn't reach the peddles and learned to ride it with my leg through the bars. I didn't grow into it till the next summer, but I loved that bike. Thank for the chance to win this great prize! My favorite birthday present is anything handmade by my kids. The did self portraits a few years ago that have been lost in subsequent moves and makes me very sad so I'm hoping for new ones this year. My favorite present was a baby doll remember my twin daughters 1st birthday more then my own Birthdays growing up was cake icecream and family small gifts. My favorite birthday present was my iPad! There was a little whispering from my kids to my husband! My best Birthday gift was 19 years ago, a trip to England for ten days with my new beau, it was our official "first date" although we had known each other for awhile, and we are still on an unending first date and celebration. Love the cards and drawings my kids make for my birthday every year! Thanks for the chance to win! What a great post! I love it! My most favorite birthday gift of all time was my Nikon camera. It's been the gift that just keeps on giving and I love taking pictures so it was also the best gift ever!!! Thanks for the chance to win a book. If I don't win, that's okay, I still plan on buying one to add to my first book (that I was in). Congrats on being a part of such a great book! My favorite birthday present was a mother's ring. 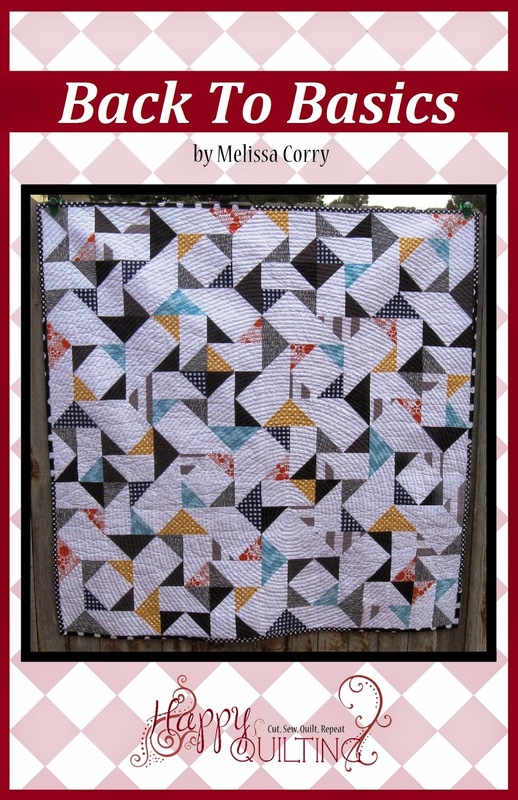 But I also love anything quilty! On my last birthday, my mother gave my son some money to purchase flowers for me. I STRONGLY suggested that the flowers be on fabric in a layer cake! He took my suggestion and got me a Ruby layer cake! Love those kinds of gifts!!!! My favorite birthday present was my sewing machine my parents gave me for my 21st birthday and I am not saying how long ago that was! How many 21 year olds would get excited about a sewing machine and even cry? Weird, I know. What a fun book! My favorite bday is when all of my kids are home to help me celebrate. My favorite birthday gift are the cards my daughter makes for me. She's 23 now and still makes them and I love them! I agree, I am all about the cheesecake! My favorite birthday gift is the gift certificate to my local quilt shop that my hubby gives me every year. My favourite pressie was my digital camera. The whole family clubbed to gether to buy it. It opened up the whole world of Flickr and swap groups to me. my fave birthday present was a plane ticket to Georgia to visit my cousin! My favorite birthday present was a Kindle Fire from my kids. Thanks for the generous giveaway. One of my fave presents was when I turned 50, My co workers got me a beautiful flower arrangement. Favorite Present, I'm not sure, but last week, my daughters made dinner and my husband made cake. Can't get much better than that! I have had a lot of fun birthdays but the dreaded 40th was one of the best. I celebrated the entire month of June that year. I knew I deserved it! My favorite birthday present was a new lens for my Canon camera that my husband bought for me a few years ago. Thanks for the giveaway! My husband bought me a beautiful silver butterfly necklace with my children's birthstones in it. It was a custom piece that he designed - so sweet! My favorite birthday is when I get to spend it with my family as we're spread all over. Those are better than any gift! On my 5th birthday I received my very own kitten. I thought it was the most wonderful gift, given to me by neighbors. My mother did not think that it was such a great gift. She told me years later that those neighbors gave EVERYBODY a kitten! They had tons of cats and way too many kittens. Thanks for hosting the give away! It is so fun to learn about people we follow in blogland! Thank You for sharing. My favourite birthday gift would have to have been an early gift from my mom of my Janome 4100qdc sewing machine. I was using a very poor singer that drove me nuts. She was able to get a fantastic deal on it as a trade in. 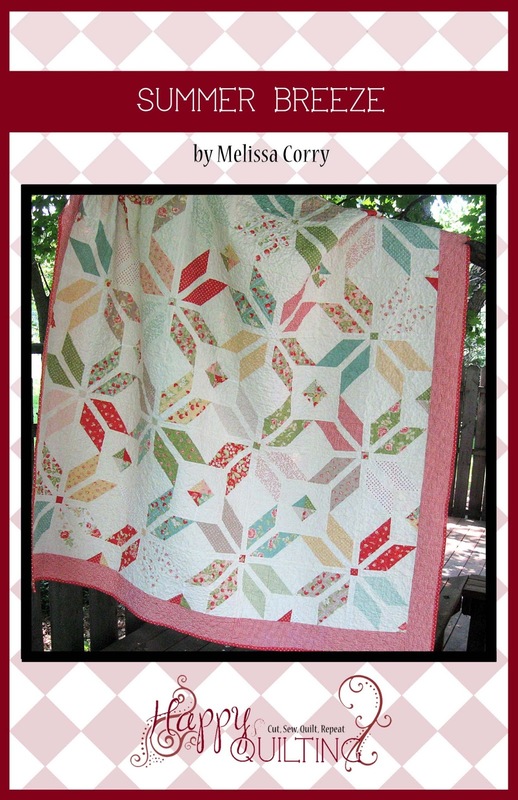 So I am making her a lovely quilt with it now as a huge thank you! 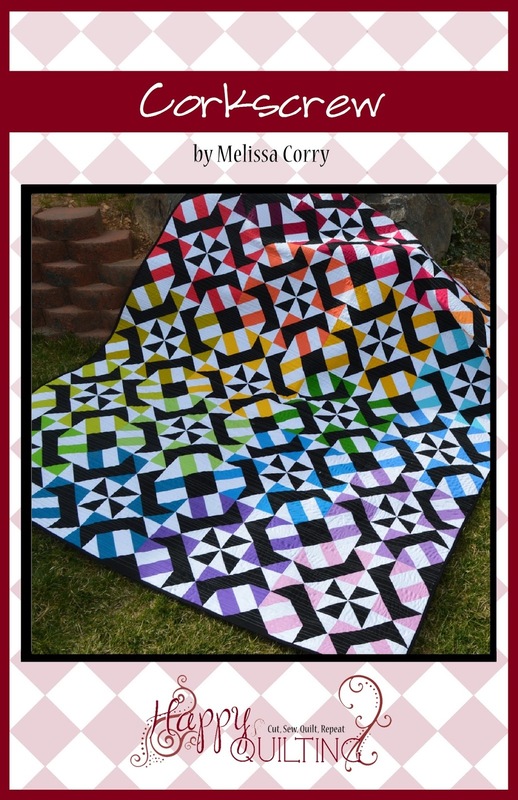 Ok, the quilty pants are a riot! My best birthday gift was when I turned 16. My mom gave me a gold necklace that had a heart made of gold leaves that had a pearl dangling in the center. It was my grandma's and she left it to me when she died. I named my oldest daughter after my grandma, and she'll get it when she turns 16, although I'll be very sad to part with it! You are one amazing lady. You have taken the time out from your busy life to contribute 3 projects to this fantastic book. Can't wait to win one myself. 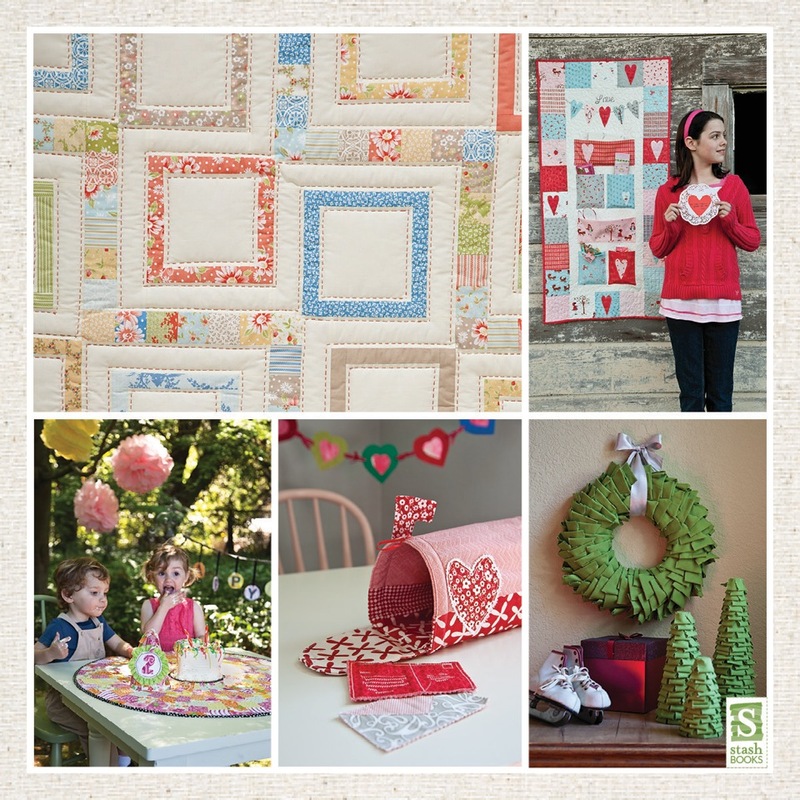 So many great designs to keep one so busy this winter. 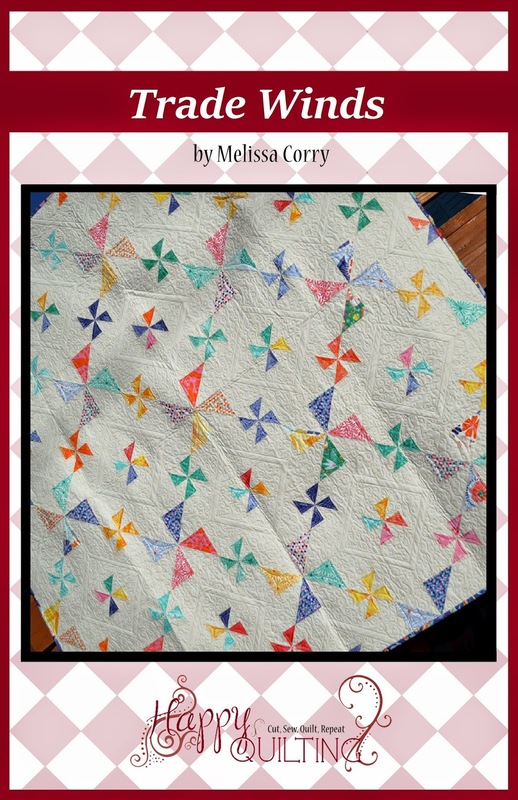 As far as the patchwork bomb, I would like to see some of my high-school friends that were so mean and thought they were so special wearing patchwork dresses to school. 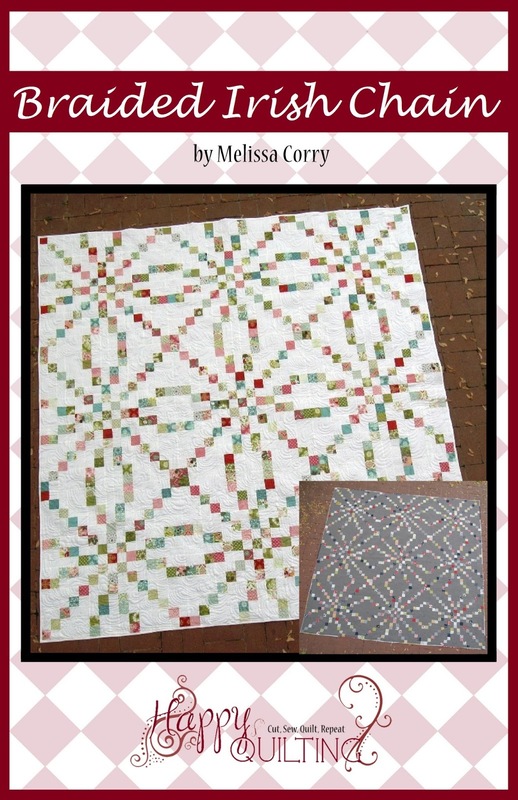 As far my quilt shop spree, I would be taking MODA Jelly Rolls. Got to love these. My mom always baked me a banana cake for my birthday. So darn good and was always a favorite. Thank you for giving us all a chance to win that awesome book, a MODA layer cake and that wonderful recipe. sewing machine. Thanks for the giveaway! I'm so excited about this!! I LOVE all things MODA!! What a fun giveaway :) :) And my favorite present ever? My sewing machine!!! Thanks! The first birthday cake pics of your kiddos are so sweet! A favorite birthday memory is from my 19th birthday. My grandmother made a cake shaped like a grand piano (I was a music major in college) and it was so beautiful! Hadn't thought about that in years - thanks for reviving a really sweet memory! My favorite birthday present that's a hard one, but love when my children make me something personal. 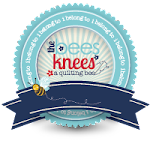 Last October, my guild was having its' semi-annual quilting retreat and decided to have two four-day retreats back-to-back. Of course, I wanted to go to both but couldn't really afford both. My birthday was at the end of the month, so my daughter paid for one of the retreats so I could go for the whole week. I consider these retreats therapy, so this birthday gift was among one of the best. My favorite was a cake that my daughter had specially made. It's sides were quilted and had scissors, thread, and needle made of sugar on top. Thanks for the giveaway. My fav present was a huge bundle of fabrics and scraps from a friend - oh the possibilities! My birthday is three days after Christmas so growing up it always was a part of Christmas. I guess my best birthday memories are of my 7 kids birthdays and the many cakes and cupcakes made for them over the years. My best present was having a grandson born on my Birthday! Hmmm instead of a favorite gift - - My brother was born on my birthday when I was 4 -- that was pretty special! Today at 55 and 51 when we celebrate birthdays it is still pretty special! Love reading your blog daily! My favorite birthday presents came last year just before and after my birthday. A month before my daughter gave birth to identical twin boys, my first grandchildren! Six weeks later (and a week after my birthday) my daughter-in-law had a beautiful baby girl. I have enjoyed these three for the great joy they have brought into our lives..
What a cute little bunch of kids you have !! And the cheesecake looks yummy..very tempting! 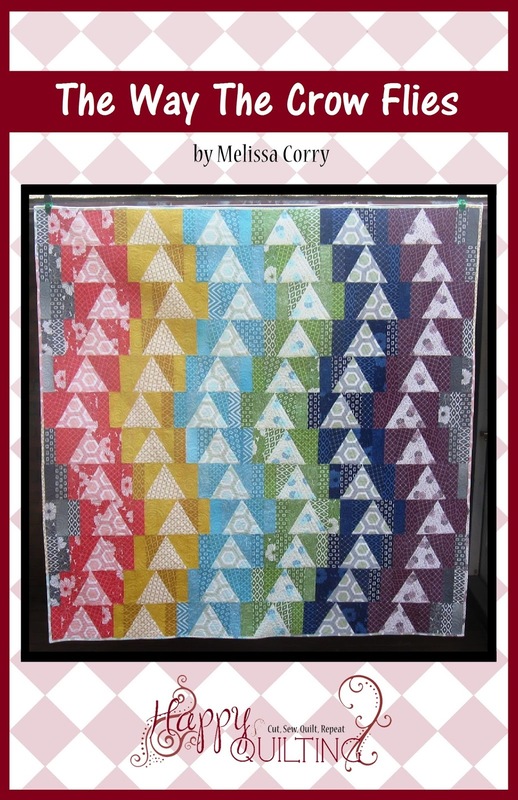 I also see your "Refracted" quilt there!! I am still working on my version (I think mine is "Fractured"!!) but have trouble with the pointy bits! Anyway...I digress....my favourite birthday gift? Well, my husband gave me an inflatable air mattress this year! We hiked the Inca Trail, which was 3 nights tenting....and I don't tent! So this "Mother of all Air Mattresses" was compact, but made sleeping on the ground almost comfy!! :)Great gift! my favorite birthday present was my first born, she was due on my 30th birthday but came a week early! This is my first time on your Blog and have enjoyed it. Your kids are adorable!I don't have a favorite birthday gift however, my husband went in halves on a new sewing machine recently and I love it! Thanks for the chance to win a copy of this book and your snicker cheesecake recipe sounds yummy. My husband gave me a beautiful antique ruby ring for my 60th, that I really treasure. Your kids are all adorable. I have 5, too - 4 boys & 1 girl. Life was never dull! My favorite birthday present was this year.... my friend's son, who is as dear to me as if he were my own, stopped by my house on my birthday and brought me a Walmart sack filled with every quilting magazine on the newstand. He said he didn't know what to get me, but knew I would enjoy these... It was the sweetest, most touching thing anyone gave me that year, because of the thought. When I was 12 I got a beautiful pink Schwin bike. I put in alot of miles on that bike and I think I even had it when I got married and moved away. I don't know what became of it but a few years ago there in Sears was a Beautiful pink Schwin bike. now pink is not my color now days but I just had to have it. Here I am 50 years later with a beautiful pink Schwin bike. My favorite birthday present is just being able to spend time with my family and make whatever I want for dinner (without trying to please everyone else). Well, I got a kobo ereader for my birthday this past year, after some very very heavy hinting, but still! hubby came through. :) Thanks for the giveaway. A bouquet of flowers when I turned 21 which was many years ago. Wow! I can't think of a favorite birthday. My husband's is only 2 days away from mine and we usually celebrate with another friend that is 2 days away from that. It's a birthday tradition so it makes it fun. And I'm with you, nothing is better than cheesecake! So I can't wait to try your recipe. The new book looks like it is going to be a favorite too. Can't wait to see it. Thanks for the opportunity of an awesome giveaway ~ and the Snickers Cheesecake recipe ~ I really can't think of a favorite gift other than spending time with my family, especially husband and my two little granddaughters ~ ok, their mom and dad too! My favorite birthday present was a beautiful pair of earrings my Dh offered me. I got married the day after my 25th birthday and he gave the earrings to wear on our wedding day. 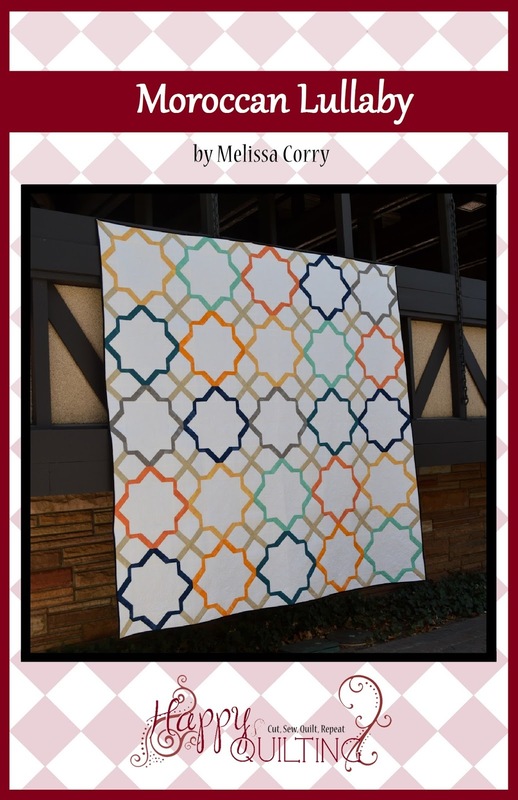 Great post, Melissa! It was fun getting to know more about you. I LOVE cheesecake. Yum. My favorite birthday gift is actually a card--every year my husband and I make a card saying the same number of things we love about the person as the age they are turning. The last one I got had 30! Without fail it is the thing we look forward to most each birthday. My favorite birthday present was getting a whole bunch of quilting supplies including a new cutting board. I really needed that board since my previous one was several years old (lol). Thanks for the yummy recipe and the chance to win the book! My favorite birthday was last year when we showed up at my mom's for her open heart surgery. My birthday was 2 days before and pretty much forgot about it. My sister inlaw came bust through the door with cake and ballons! I hadn't seen her or my brother in 5yrs. That and moms surgery going great was the best i ever had. Snickers cheesecake? I aught to report you to my Weight Watchers leader!!! What a fun post. Thank you for the chance to win! My favorite gift? Hmm, I would have to say products from LUSH. I got a bunch last week on my birthday and can't wait to use them. Anything to pamper myself just a little. My favorite birthday ever was my 13th birthday. It was the year The Sound of Music came out. We were not allowed to go to the movies. Imagine my surprise when my dad took my mom and I for a drive and stopped in front of the movie theater. We went to see the movie in the theater! And, I went wearing the blue plaid kilt complete with kilt pin and gold cable cardigan that they had bought me for my birthday. All these many years later, that birthday sticks in my mind as my best. Funny thing, it was Friday the 13th! 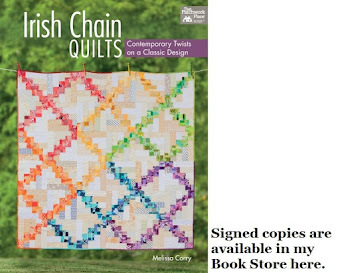 My birthday is October 13, so it would be wonderful to win this book for my birthday! My best birthday gift was when my hubs threw me a surprise birthday party. On my 42nd birthday. I totally didn't expect it. 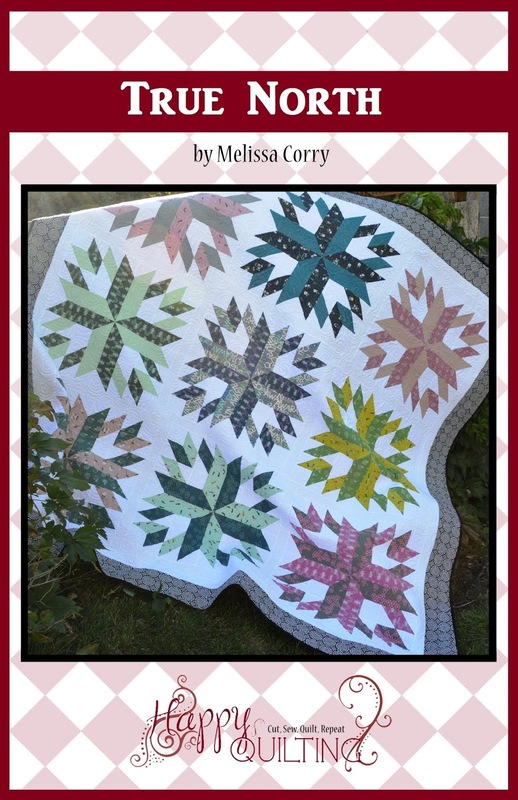 One of my favorite gifts was a gift certificate to my favorite local quilt shop. All the women in my family line are born in the same month. I loved the first year my daughter was born.... unplanned blessing,, only girl for me and yes born in the 'our month' My Mom and Gram threw the 'girls party' for me and my lovely daughter that year. My favorite gift is my daughter and to be able to share her with the women in my family. My favorite birthday gift was probably this iPad that I got( bought) for my birthday just a few weeks ago! My favorite gift was my Nook Tablet. 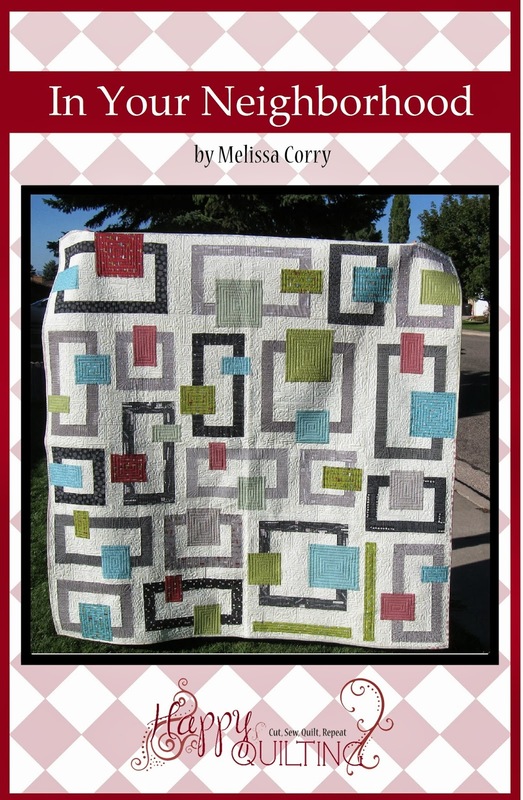 Now I can read quilting blogs all the time. My favorite gift was a Kindle book reader. The Kindle was/is great but the birthday was even better because my husband went to such great lengths to keep it a surprise! Thank you for the chance to win! My favorite birthday present was when one of my kids shopped for a pattern and fabric and gave it to me. I thought. About her the whole time I was making it and then gave it to her, knowing how much she would like it. 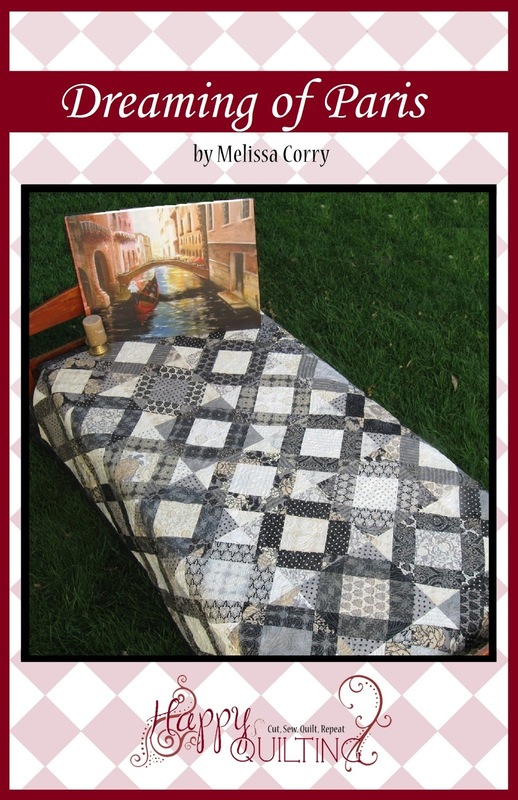 Thanks for the opportunity to win the book & fabric giveaway! I think my favorite birthday present would have to be pearl drop earrings from my husband. Congratulations! My favourite birthday present was just this past year - my daughter and her husband redid my entire front gardens for me! Thanks for the opportunity. My youngest daughter was born on my birthday nine years ago - best present ever!! Well I have had lots of great birthday presents but one thing that stands out wasn't really a present at all. I guess in a way it was. For one of my younger birthdays instead of a cake I got a gingerbread house! It was so cool. I loved it. I guess that is what happens when your birthday is really close to Christmas! Thank you for the chance to win. Can't wait to try your cheesecake recipe. Thanks so much for sharing it. My favorite B-Day present was the first card my daughter made me, 18 yrs ago. She just turned 21 and still makes me a card every year. Thank you for the giveaway! My most memorable birthday was taking possession of a Ranger pick up truck that we used to take our sons things to and from college. That aside, all birthdays are my favorite - it means I am still sewing. Thank you for this great and fun giveaway. My favorite birthday present was supposed to be a Christmas present. The only thing I asked for was a telescope and was disappointed when it wasn't there. We took the tree down on my birthday and, lo and behold, there was a present under the tree platform. My mom felt bad that she had forgotten it was there, but I was the happiest kid on the block!! my favorite birthday present was going to the coast to spend the day with my extended family, and go to the aquarium- i love it there! We have something in common Melissa. I'm a cheesecake birthday girl too. Nothing better than cheesecake with a little chocolate mixed in. I'll have to give your recipe a try. We don't do presents in any big so my favorite is when the hubby does something special for me like hang cabinets in my studio. My sisters and I get together every year on our birthday and go clothes shopping. It's so much fun to try on clothes and get an honest opinion and also see what it looks like on someone who looks just like you. We almost always end up getting something the same. Birthday cake with extra icing is always a must. My favorite b-day present was my overlock machine... 18 years ago and still enjoying it! Gah! Your Snickers Cheesecake sounds SO YUMMY! Loved the interview--thanks for sharing. One of my favorite birthday presents was given to me last year: my niece sent a framed photo of her mother and me. I love looking at that moment in time and feeling the love extend to today and beyond. My favorite birthday presents were the births of my children. It was a birthday even if not mine and they're my best gifts ever. We also had a tradition for mine - attending the State Fair. Fun! You would think that after 50 years, I would have a favorite birthday gift but not really. This year we went to our cabin in the mountains and spent a quiet weekend there. It was all that I wanted. Bliss. Thanks for participating in the tour and for the cheesecake recipe. I get my favorite birthday present every year. The Albuquerque Balloon Fiesta! The first day of the weeklong celebration is on my birthday this year. It happens quite often that the first day is on my birthday. There are over 500 balloons. I'd say that's a pretty cool present. Even though I don't live in Albuquerque I can watch it live on the computer. I'm terrible about remembering birthday gifts...but I loved the one my husband got me this year. A set of quilted Vera Bradley travel stuff. Thanks for the chance to win and for the yummy recipe! My favorite birthday present is celebrating with my family. Last year, my darling grand-daughters (ages 4 and 6 at the time)gave me a "spa day". It was hilarious and fun and they even put cucumbers on my eyes. Now that's a b-day celebration. Great post Melissa. My husband doesn't like cake either and we always get him a birthday cheesecake. I've printed your recipe and might make it for him next year! A favorite birthday present was just after my son was born and my husband gave me a gorgeous ring with his birthstone (my own version of a mother's ring!). fun to read more about you. the kids are adorable. I remember one of my best gifts was a silver charm bracelet for my sweet sixteen birthday. 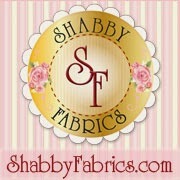 I think my favorite birthday present now is a gift card to a fabric shop. One of my most favorite birthday gift was when I received a Betsy McCall doll from my aunt. She was so cute! I wish I still had her. After I opened her my Mom made a little red riding hood out fit for her. I felt so special. Thanks for the chance on your wonderful giveaway! HELLO! THANKS FOR YOUR POST! MY FAVORITE BIRTHDAY GIFT WAS MY DOLL HOUSE WHEN I WAS SIX! What a fun looking book. I can't wait to see it. Thanks for sharing. For my favorite birthday gift....I don't recall a favorite gift, but I have a favorite childhood birthday memory. Each year, my mother would make a big deal out of birthdays and she would purchase a beautiful birthday cake with butter cream icing, I loved those cakes with the perfect flowers and yummy icing. My favorite birthday present is a pair of earrings my husband got me before we were married. His grandmother is Japanese, so he's got some Japanese heritage and he got me a pair of earrings that are antique (18th century) Japanese coins. I think these earrings are my favorite piece of jewelry I have. Favorite birthday present would be the fabric my husband gave me one year. 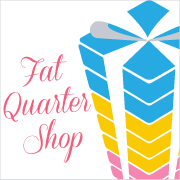 He picked out a bunch of fat quarters and eighths all in colors he thought would make me happy. My fav birthday present was an Easy Bake Oven when I was about 7 years old. Loved those little cakes! 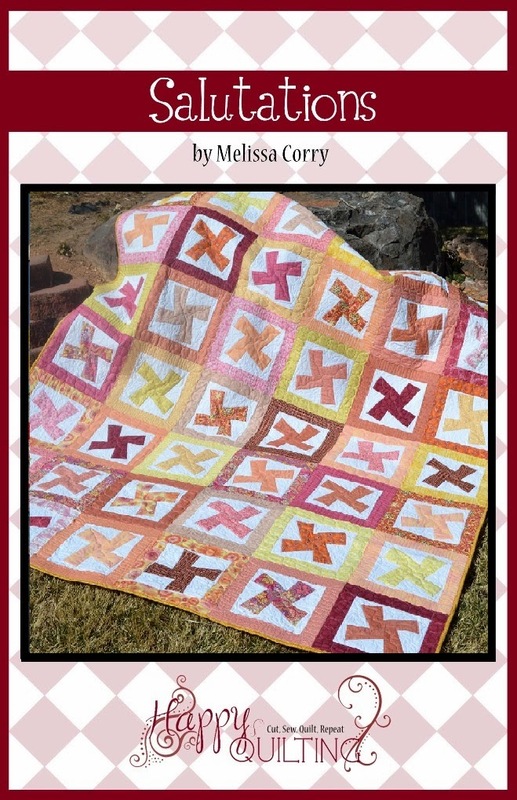 I love your blog and all of your cute projects! You are an inspiration! 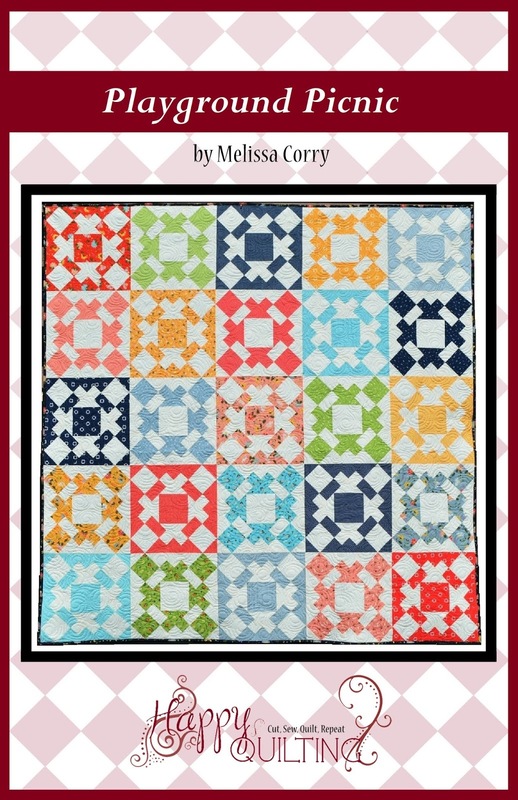 My favorite birthday present was gifted to me on my most recent birthday ....a fat quarter bundle of Cameo by Amy Butler and Seaside Cottage by Heather Mulder Peterson!! Thank you for the chance to win and the yummy recipe! Favourite birthday present would be my first bike - for my 7th birthday! My birthday is 5 days before Christmas so it was celebrated very much when I was growing up. When my daughter was in high school she wrote me a poem for my birthday that was 3 typed pages long. Perhaps it is really an ode. Just thinking about the words brings me to tears. My favorite recent birthday present was really a night with my sisters and mom when I turned 30. We went to dinner and had dessert and it was great to spend the evening just the 4 of us. That doesn't happen enough anymore. My favorite gift was a pincushion that my son made for me. I used it for almost 25 years until it finally fell totally apart! I kept his sweet note but the rest was pretty much toast. My husband surprised me with a birthday party and a trip to Vancouver Island! I received my engagement ring for my birthday 43 years ago - still married!! dh just gave me an early b-day present (Oct 8th)--- a Gammill Vision 26! That is a pretty great b-day memory (future memory maker, also.) And each of my grandchildren's birthday celebrations are such marvelous fun! I favorite birthday present was from my husband. It was a string of pearls, and I was very surprised. Can I give a favorite birthday cake instead? I know you're not a cake fan but I'm a cake fanatic! I'd rather have cake than presents! My two favorite cakes.....a Barbie cake my mom had made for me when I was four. I still have a picture of me and that beautiful cake and I got the play with the Barbie after the cake was gone. I had told my husband about that cake and about four years ago, he had a Barbie cake made for my birthday. And I got to keep the Barbie after the cake was gone too! My favorite was a beautiful Alexandrite ring with diamonds in it which my husband gave me. He knows how much I love purple and the Alexandrite gemstones change color from a rich green to red or to a brilliant purple depending on the light. I, too, would choose practically anything over cake. A favorite memory is when I was at college my mom would bake me huge cookies (pizza pan size), decorate them, and put them on the bus (!) to me. She'd call and tell me to meet the bus and I'd get my "birthday cookies" all nice and fresh and ready to share with my dorm friends. Every year my favorite presents are homemade cards. My son is 31 and still makes them for me. My oldest son had just started his very first job. He had save his money from each paycheck to buy me a nice ring with all the birth stones of each of my children. It was such a beautiful thoughtful idea. I love that ring. My husband's grandmother makes the most amazing chocolate cake with roasted pecans. Last year I was in my bathrobe for my birthday because we had just gotten home from the hospital with our first born baby. His grandmother brought me a small cake. It was the best thing I had ever tasted! My mother always makes a chocolate cake with a whipping frosting covered in a peppermint, chocolate ganache. Delicious!! It's always my favorite present from my mom!!! it has to be my last bday celebration, the whole day in a spa followed by a lovely small party with family! thanks for the chance to win! My favorite birthday present by far would have to be diamond earrings my soon to be husband bought me when we were dating. He was doing alot of contracting and gone alot and it was a birthday gift/thanks for being so supportive gift. Still wear them everyday! Thanks for the chance to win. Looks like a great recipe! My fave birthday present was from my colleagues when I was in the desert, full proper afternoon tea at the best swankiest hotel in the area! Heaven! As for birthday cake, my children and I are "over it", and choose to celebrate with pies instead. My daughter Carmelita always chooses the best presents for me. This year I received ocean themed art glass shapes. My favorite gift for a birthday was a Baby Ruth doll. I still have it. I would rather have brownies with coconut pecan frosting than cake any day. My favorite birthday present was given to me by my husband about 4 years ago. I had to work a 12 hour shift that day, and when I came home the house was dark. I was thinking "great, he went out to eat and I gotta find me something for dinner." I walked into the kitchen and he had set up a gorgeous candlelight dinner for 2 with steak and baked potatoes and steamed broccoli. And he did the dishes afterwards. Honestly, as long as I can tell that there was thought and effort put ino a gift, I don't care what it is. It always means so much to me when someone makes a gift or a card because I know that they spent their time and energy on me...to make me happy. I've been blessed enough to have many of these gifts over the years and I don't think I could choose a favorite. Fav birthday gift ... perhaps a pair of handmade earrings given to me by my daughter. They are made from the pages of a book and were cut to include text on one side and durum wheat on the back. The paper pieces were shaped, dipped in a sealer and then the ends were dipped in liquid gold. I love them. They are the perfect gift for a prairie girl / librarian. I have to say my favorite birthday present was when my grandma bought me a Barbie conopy bed, Birthday Barbie and extra clothes. I love those momories. The bed would light up! Your daughter is beautiful! My favorite birthday presents are usually from my older brother. Since my birthday is just before Christmas, he made a tradition of giving me delightful ornaments for my Christmas tree. They always are unusual yet have some direct meaning in my life. My husband gave me a trip to New Zealand for my birthday one year, it was awesome! Thanks for giving everyone a chance to win. My husband is taking me to England! I'm so excited.